Browser tabs have made it easier to multitask, whether you’re at work or browsing the web for personal reasons. As I write this I have 12 tabs open on three windows and as the day progresses that number will only increase. As we open more tabs, browsers tend to give way and crash which leads to loss of focus and time. And even without a crash, all these tabs will squeeze in, making it almost impossible to decipher what page is open on a particular tab. Here are some tricks and extensions which will help you use tabs more efficiently. Pin tab: Sometimes when I’m immersed in browsing and reading stuff from several tabs I tend to unintentionally close a tab that I really need. This feature allows you to pin the tab so that such an accident is avoided. Simply right click on the tab that you wish to pin and click on ‘Pin tab’. That will reduce the tab into a small icon and it will be placed on the first position on your browser without the close icon. When you wish to close it, simply unpin it and you will see it come back to its initial state. Shortcuts to better browsing: Most of us know that pressing ctrl+Tab helps us navigate from left to right through the tabs. Pressing ctrl+shift+Tab will help you navigate from right to left. And the next shortcut is going to save you a lot of time and pain of going through scurrying through history. Ctrl+Shift+T gets back the last closed tab. Remember it the next time when you accidentally close a tab. Save it for later: It’s 5.30 pm and you still haven’t left office because you have a lot of reading and work to do. Instead of closing all your tabs and relying on memory, you can bookmark all the open tabs for later. Click on the gear icon on Chrome > Bookmarks > Bookmark open pages. When you return to work the next day you will have them all saved in your bookmarks folder. Tab groups: Pressing Ctrl+Shift+E will take you to tab groups. This feature helps you to group related tabs together. Using this feature will let you switch between groups and search all your existing tabs. Click on any tab and you will return back to where you were. Bookmark and Pin tabs: Similar to what we saw on Chrome, you can bookmark and pin tabs for efficiency on Firefox too. Just right click on any tab and click on bookmark all tabs or pin tab as and when necessary. Too many tabs: This app for Chrome makes tab management more visual and bearable. It provides an enlarged preview of the tabs and when you click on the one you desire it will bring that tab to the front. Otherwise, having 27 tabs open on chrome makes reading or even deciphering tab icons difficult. 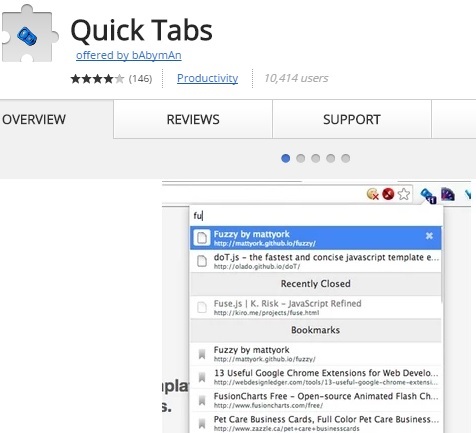 Quicktabs: This extension allows you scroll through tabs. It even lets you search through them as indicated in the image below. That should take a lot of tab stress off your mind.